Masonry (Block) Saws | ASJ Small Engines, Etc. Masonry Saws are used in construction and the installation of driveway pavers. They are typically large, engine driven, free standing units with a movable bed, so that the block can be placed on the bed, and the bed moved in a single direction toward the spinning blade to make the cut. 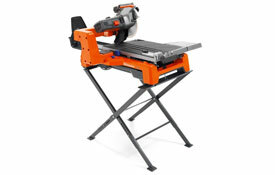 In addition to servicing virtually all of these units, ASJ sells Husqvarna Construction Equipment Masonry Saws.